Flying elephants? You wait till you hear the one about the guy they painted blue! Tim Burton heads to the big top to take on the classic Disney tale of the flying circus elephant. Take Disney’s mega-budgets, a classic and beloved children’s character and the creativity of Tim Burton, and Dumbo was always going to be a gorgeous film. Sure enough, this reimagined family classic is spectacular and visually-stunning, with a masterclass in character design for our titular pachyderm. Most audience members will be familiar with Dumbo lore before sitting down for Burton’s reimagining. The story of the little circus elephant born with gigantic ears is a Disney classic from 1941 – perhaps not always the first one you think of, but one that most people will remember (at least a little). It’s always been one of the saddest and most morose of the animated classics – elephant is born into the circus trade, ridiculed, separated from mother – so it was perhaps a logical choice to have Tim Burton, known for his weird and wonderful ‘dark’ films, to take the helm. That said, many of the director’s recent films have been family-focussed big-budget numbers, so those looking to take their little ones to see a reimagined Disney classic needn’t worry too much about skeletons or men with utensils for limbs popping up. One of the bigger differences between Burton’s film and Disney’s original is the pacing, which actually has a huge impact on the narrative and tone. 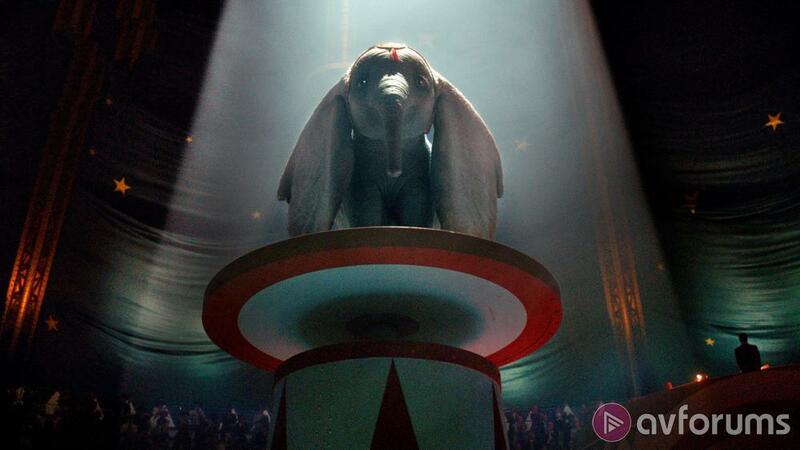 In the 1941 film, Dumbo doesn’t actually whip out his magical flying ability until the latter stages of the film, so we finish with an upward lift and climax. In the 2019 version, Dumbo discovers his powers much earlier, which means there’s a lot more plot twisting to come later. This means, sadly, that each time he swoops around the big top it’s a little less jaw-dropping, and it also leads to quite a few more bleak storylines and unnecessary twists and turns that detract from the wondrous magic one might expect from a Disney film about a flying elephant. After the initial flight, the film starts to lose itself in the various storylines and unnecessary complications. The problem is that this film, which feels just a smidge too long, is shackled with needless storylines and modernisations. There’s a lot more going on than in the original Dumbo, with plotlines coming from every direction, the introduction of several baddies and a lot more human focus. Elephants never forget, but even they might struggle to recall all the various plotlines going on in Dumbo. In this iteration, we have live action human characters and a CGI elephant who completely steals each scene he’s in. We’ve got the huge ears, of course, but puppy-dog eyes and incredibly lifelike facial expressions mean Dumbo fits in seamlessly with his human co-stars. In the old film, there was Timothy the Mouse and those infamous crows to parry the story along, but this time around most of the action involves our live action characters. Holt Farrier (Colin Farrell) is a former circus star who’s returned from the war to care for his two children Milly (Nico Parker) and Joe (Finley Hobbs). Farrier has lost his wife to illness and his arm to the war, and returns to Max Medici’s (Danny DeVito) circus to find his former co-starring horses have been sold, and he’s been tasked with caring for the elephants. Enter villainous VA Vandevere (Michael Keaton) and partner Collette (Eva Green), who swoop in like a large corporation and take over Medici’s operation. There are some puzzling elements to the film, where misfit plotlines and wacky character choices – which themselves befit the oddball circus setting – don’t quite fit together with the whole, and make for a bit of a crowded and convoluted plotline. Part uber-cutesy Disney classic, part darker, deeper story, Dumbo is generally enjoyable and certainly an exceptional piece of visual art. The cast manages to put in a wide variety of thematic performances, which only add to the bizarre-o tone of the film – there’s Farrell, the dashing cinematic hero; DeVito, milking carny tropes for every last element of fun; Green’s mysterious and suspicious femme fatale; Keaton’s borderline out-of-control crazed villain. It’s rare for the performances – captivating as many of them are – to feel part of a cohesive whole, and though this arguably suits the outcast setting, it makes for a bit of an exhausting watch. There’s something delightfully ironic – and most clearly uncoincidental, given the obvious nods to Disney theme parks within the film’s world – about Burton, whose big budget films have often seemed stripped of his unique soul, making a film about a tiny, proudly oddball circus getting taken over by a big corporation. It’s almost as though he’s making a satirical film about the growth of Disney, financed by Disney. Indeed, Dumbo, despite the phantasmagorical characters and spectacular colours, does find itself lacking a little bit of Burton’s signature subversive mischief. Visually, Burton pulls out most of the stops, with a phenomenal carnival background, eye-catching set pieces and really beautiful cinematography by Ben Davis. Young audiences won’t mind the convoluted plot, because there’s more than enough to keep the eyes entertained. It’s a fairly straightforward version of the film – it’s likely what you’d expect from Disney’s latest remake, though probably not what you might have expected or (or hoped for) from Burton. By the end, it has managed to come together into an enjoyable family watch, combining the heart-warming elephant CGI with sumptuous visuals and a variety of entertaining performances. It does, in the end, manage to get off the ground, though it’s probably only got enough wind beneath its ears for one circuit of the big-top. Write your Dumbo (2019) Movie review.